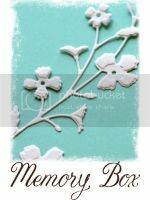 Hi - hope you enjoyed our blog blitz on Outside the Box this week - and that you commented on each designer's post to enter the daily drawings for the new Memory Box Dies. Here's a Valentine card I did for the blitz. View the 2013 Collection here. Here's a design that combines something(s) old with something(s) new. The new dies are the Grand Oak Tree 98462 and Set of Swings 98463. The hearts are cut from red felt with the classic Heart Delights 98260 from the 2012 Collection. The assorted 'x' and 'o' pieces are cut with the Parker Upper Alphabet 98364 and Parker Lower Alphabet 98363. Let ribbon candy, candy jars and pretty colors highlight your Valentine's Day celebration with Memory Box Dies and papers. Candy Jar, Tall Canning Jar, Vintage Apothecary Jar, Heart Delights and Ribbon Candy Border are the perfect combination of sweetness - no fat, calories or carbs! See the great new products in the Memory Box 2013 Collection right here. We're having a new product release blog blitz on Outside the Box - it starts on Monday, Janurary 7th. The Design Team has selected their favorite new products to spotlight and we can't wait to share our ideas with you. Visit the blog - lovingly referred to as OTB - throughout the week for great projects, techniques and prizes! It seems like an odd combination - but I love using gray and brown together, especially with a bright pop of metallic red. Here's an idea featuring four dies - Grand Heart 98254, LaRue Heart 98255, Pastry Labels 98107 and Poppystamps Nestled Bird 817. The Grand Heart and LaRue Heart are cut from prints in the Pixie 6x6 Set. The label is cut from Kraft Cardstock, stamped with Love and Hearts B1423 (hearts are attached to the side of the stamp) in Cranberry ColorBox Pigment Ink and embossed with detail clear powder. Attach Scor-Tape to scrap red cardstock and diecut Nestled Bird twice - once with the lined tape on the top, and again with the lined tape on the backside. Burnish Clearsnap Cherry Pie Designer Foils onto the adhesive on the right bird - red-foil side up. (Impress sells Designer Foils.) Brush Clearsnap Ruby Slippers onto the adhesive on the left bird. Layer the heart over strips of Vanilla Bean Distressed Dots and Gingham Cardstock. Attach everything to a Mars Shimmer A2 Card. Attach the greeting strip with antique copper mini-brads. Coordinate the card with a matching Mars Shimmer A2 Envelope. Stamps, dies and papers from the beautiful 2012 What's in the Box? release will be featured in the Memory Box 2012 classes at the Belleuve (Saturday) and Tukwila (Sunday) Impress stores this weekend. Dave and Monica and their entire team have created their best-ever collection. I know I say this about every release - but you really need to stop by the Impress stores to see what everyone's been talking about. Really. We're having a Design Team Blitz next week - on the Outside the Box Blog - showcasing the new products in great designs for every occasion. There'll be contests and prizes too - with designer posts several times a day...join us! Pinks, grays, a dash of lime and the sparkle of amethyst create a collagey Valentine here. Or - after the 14th of February - it could be a birthday, Mother's Day, wedding or anniversary card too. I love how Dave's designs work not just for holidays throughout the year, but for so many other occasions. The Quinn Flourish Die 98267 - with its heartlike "petals" could also be a pretty flower, or an artsy medallion. The Heart Chain 98277 Border is also great for diecutting felt for an instant accent in red, fuchsia or pink. The Chrysanthemum Frame G1857 pairs well with Vintage Notes E1329...like they were made for each other! Here are some other ways to use the new Love and Kindness Collection Dies. Cards from the Valentines by Design class at the Bellevue Square Impress (425 453.2748) on January 28th feature twelve dies, including some from previous releases and Poppystamps. If you don't diecut - and wonder what all the fuss is about - join us, and you'll see why we all love them! Here's a bold, bright Valentine for your special guy. The great new Classic Heart G1856 stamp and matching Cupid Heart 98281 die make it a quick and easy card. The Heart Chain Border 98277 diecuts and embosses the ten little hearts for a perfect accent. The Classic Heart is one of three great new Valentine stamps in the Love and Kindness Collection - view the entire collection here. Cupid Heart Die matches both the Classic Heart stamp, and the beautifully-detailed Serafina Heart 98278 die shown above. Pink, pink and more pink - Valentine's Day reminds me of what a special color it is. Memory Box pinks include Begonia, Taffy, Cherry Blossom, Cotton Candy, Bubblegum and Sugar Plum - perfect for your Valentine greetings, tags, banners and layouts. This design features four dies...Index Card 98214 (there's also a matching Index Card G1781 stamp, not shown here), Double Ticket 98104 - and the brand new intricate LaRue Heart 98255 and outline Grand Heart 98254. The Grand Heart is gridded for accurate alignment - so it's perfect for diecutting the beautiful new Damask Heart G1855 stamp. Dave's new multi-tasking dies are great alone, with other dies and with specially-designed stamps. The heart dies and Damask Heart stamp are from the just-released Love and Kindness Collection - you'll love everything in it!